ISRAEL IS, as we well know, the land of unlimited impossibilities. In Israel, for example, the diplomats are striking. A strike of diplomats? But that is impossible! Postmen strike. Longshoremen strike. But diplomats? The most conservative, the most establishment people? The people who serve any Israeli government, whatever its complexion? Who find pretexts for all its actions, whatever they may be? Well, in Israel it is possible. All the Foreign Office services have ceased to function. No new passports for citizens who have lost their papers in Moscow, no consular assistance for citizens who have been thrown into prison in New York. No preparations for Binyamin Netanyahu’s visit to Paris. For years, Foreign Office people have suffered from miserable working conditions. Their salaries are bordering on the ridiculous. So they went on strike. DOES THIS infuriate the Prime Minister? Is the Foreign Minister upset? Not a bit of it. Netanyahu does not go out of his way to put an end to the strike, and Avigdor Lieberman does absolutely nothing to tempt his employees back to their desks. Both do not care. On the contrary, they look almost happy. For all they care, let them strike forever. And they are right. This week, everybody realized how right they are. The President of the Russian Federation, Dmitry Medvedev, was scheduled to visit Israel. But before that, he went to Jericho, which is considered the oldest town in the world. There, in the presence of President Mahmoud Abbas, he declared that Russia had recognized the Palestinian state long ago, and that it continues to recognize the Palestinians’ right to a state of their own, with its capital in East Jerusalem. Not exactly. It was not Russia that recognized Palestine, but the Soviet Union. And the recognition was conferred on the virtual state declared by Yasser Arafat in 1988. That is very different from recognition of the Palestinian state now, when it is becoming a reality. After his visit to Jericho, Medvedev was to come to Jerusalem, to be photographed next to Binyamin Netanyahu and shake hands with Avigdor Lieberman. How was Netanyahu to react to the Jericho declaration? How could he extricate himself from this matter, without humiliating himself or offending the largest country in the world? This embarrassment was avoided by the sanctions of the Israeli diplomats. They refused to prepare the visit and organize the meetings. Medvedev gave up, and the two great statesmen – Netanyahu and Lieberman – could breathe again. Deep in his heart, Lieberman surely blessed the people of his office, whom he hates. They saved him. What could he tell Medvedev? Ever since walking into the Foreign Office like a bear entering the proverbial china shop, he has boasted of his excellent relations with Russia. The Americans loathe him? So what? America is a declining empire. The Europeans don’t want to meet with him? So what? Who are they, anyhow? But Russia is Russia. Here we have a real friend. Lieberman admires Vladimir Putin, that great democrat, who knows how to deal with cheeky people like the Chechnyans. Lieberman speaks with him in his mother tongue. He boasted of having established really intimate relations with Russia. And now they do this thing to him. What a disgrace. BUT THE truth is that Putin is not really his friend. Yvette Lieberman (his original name) has only one real friend in the world: Aleksandr Lukashenko, President of Belarus, “the Last Dictator in Europe”. True. Lieberman was not born in Belarus, but in Soviet Moldavia. But there is no doubt that Belarus is his Second Homeland. In its capital, Minsk, he spends his vacations. There he chose to hide in the (successful) intention of blackmailing Netanyahu, when “Bibi” begged him to join the government coalition. Lukashenko is his soul-mate. He is his model. From him he learned how to deal with human rights organizations. The patent belongs to the President of Belarus, and is only licensed to the leader of “Israel Our Home”. It was Lukashenko who sent an official warning to the human rights activists in his country and threatened them with heavy penalties if they continue to “distort information” about Belarus. “The Ministry of Justice has issued a written warning,” said the text, “to the Belorussian Helsinki Committee for violations of the law on civic organizations and mass media and for spreading dubious information discrediting the law enforcement and justice agencies of the republic.” The police raided the premises of the human rights organizations and the KGB (yes, the old name lives on in Belarus) has started to investigate. From there Lieberman drew his inspiration, when he opened his campaign against the peace and human rights activists in Israel, whom he called this week “collaborators of terrorism”. I don’t speak Slavic languages, but I am sure that it sounds more authentic in Belarussian than in Hebrew. ONE CAN laugh (for the time being) at Lieberman’s claim that the peace and human rights organizations cause the de-legitimization of the State of Israel, and especially the de-legitimization of the Israeli army. But one cannot laugh about the de-legitimization itself. More and more governments are recognizing the State of Palestine, boxing the ears of the Netanyahu government in the process. When the Palestinian National Council declared, 22 years ago, the foundation of the independent Palestinian state, about 110 countries recognized it. All of them raised the status of the Palestinian delegations to the rank of embassies. The Israeli government ignored them. In its view, that was an empty declaration and a meaningless recognition. It did not change the realities on the ground. In its eyes, one new settlement in the West Bank was more important than the opinion of a hundred countries. As they say in Yiddish: Oilam Goilam – the world is a Golem (the clumsy monster of Jewish legend.). 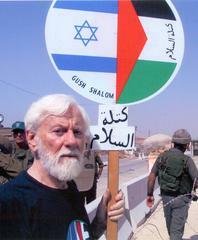 But the new wave of recognition of Palestine is a different matter altogether. When important countries like Brazil, Argentina and Chile recognize Palestine, and draw behind them the other Latin American countries, this is significant. When Russia renews its recognition, through its highest official and on Palestinian soil, this is an important event. If anybody is relying on the rock solid American support we are used to, they should pay attention to a small news item that appeared this week: the permanent delegation of the PLO in Washington DC was allowed to fly the Palestinian flag over its building – a right generally reserved for embassies alone. An interesting plot is unfolding. Two thirds of the world’s countries have already recognized the State of Palestine, and the wave is gathering momentum. These are no longer just small third world states, but significant actors on the world stage. Mahmoud Abbas and Salam Fayad are quietly and persistently building the institutions of the Palestinian state. They are investing a lot of effort in development, building a new town north of Ramallah, restricting the powers of the security services and gaining the sympathy and attention of the world’s governments. So what? – the average Israeli asks. After all, the Goyim are only proving yet again that they are all anti-Semites. How is this important? We control the territory and no diplomatic tricks will change that. And as long as we have unlimited American support, we don’t give a damn. Really? For many years we could rely on the Americans with eyes closed. Every “anti-Israeli” resolution was met with a firm American veto. But is this still so certain? When all the important countries in the world recognize the State of Palestine – will the US alone hold out forever? While the Israeli diplomats are striking, a new initiative condemning the settlements is gaining momentum in the UN Security Council. The entire world is against these settlements, which are manifestly illegal under international law. Even the US has demanded a freeze. Can the US veto a resolution that expresses its own policy, without becoming a laughing stock? And if it does do so all the same this time, what about next time, or the time after? And if the American veto still rules the Security Council – it does not rule the UN General Assembly. It was the General Assembly – and not the Security Council – that resolved in 1947 to set up in Palestine, next to each other, a Jewish and an Arab state. If the Assembly decides now that the time has come to realize the second half of the resolution – the establishment of the Arab State in Palestine – it will strengthen even more the world-wide recognition of Palestine. THE ARAB governments, which have lately paid only lip-service to the Palestinian cause and have not lifted a finger to help in the creation of the state – must now think again. In Tunisia the people rose up against a dictatorship just like all the other Arab dictatorships – a small and corrupt elite, indifferent towards the wishes of the people and overtly or covertly collaboration with Israel. During the 13 years of Yasser Arafat’s stay in Tunis, I visited there many times. I always knew that lurking behind the liberal and attractive facade was a tough and oppressive police-state. But I saw the Tunisian men walking in the streets with a Jasmine flower over their ear (called Shmum) and I could never have imagined that here, of all places, the first popular Arab revolt would erupt. Now it has happened. And in Tunisia. This is a wake-up call to all Arab countries, from Morocco to Oman, that dictatorships will fall, that there will be an endeavor to set up liberal democratic regimes, and if that does not succeed – Islamic regimes will take over. That is the writing on the wall. The present Israeli government is leading us towards disaster. But this week this government was shored-up even more, when Ehud Barak, the pocket Napoleon, finally abandoned all pretense of belonging to the social-democratic left and set up a clearly rightist party, something like Likud II, that will be a loyal partner of Netanyahu and Lieberman. With such leaders, does our country really need enemies?